Rina Dechter, Hector Geffner and Joseph Y. Halpern, eds. The field of Artificial Intelligence has changed a great deal since the 80s, and arguably no one has played a larger role in that change than Judea Pearl. 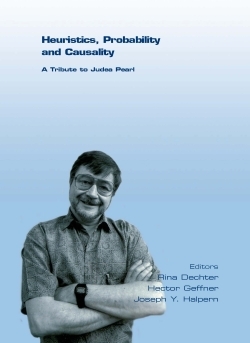 Judea Pearl's work made probability the prevailing language of modern AI and, perhaps more significantly, it placed the elaboration of crisp and meaningful models, and of effective computational mechanisms, at the center of AI research. This book is a collection of articles in honor of Judea Pearl, written by close colleagues and former students. Its three main parts, heuristics, probabilistic reasoning, and causality, correspond to the titles of the three ground-breaking books authored by Judea, and are followed by a section of short reminiscences. In this volume, leading authors look at the state of the art in the fields of heuristic, probabilistic, and causal reasoning in light of Judea's seminal contributors. The authors are Blai Bonet, Eric Hansen, Robert Holte, Jonathan Schaeffer, Ariel Felner, Richard Korf, Austin Parker, Dana Nau, V. S. Subrahmanian, Hector Geffner, Ira Pohl, Adnan Darwiche, Thomas Dean, Rina Dechter, Bozhena Bidyuk, Robert Matescu, Emma Rollon, Michael I. Jordan, Michael Kearns, Daphne Koller, Brian Milch, Stuart Russell, Azaria Paz, David Poole, Ingrid Zukerman, Carlos Brito, Philip Dawid, Felix Elwert, Christopher Winship, Michael Gelfond, Nelson Rushton, Moises Goldszmidt, Sander Greenland, Joseph Y. Halpern, Christopher Hitchcock, David Heckerman, Ross Shachter, Vladimir Lifschitz, Thomas Richardson, James Robins, Yoav Shoham, Peter Spirtes, Clark Glymour, Richard Scheines, Robert Tillman, Wolfgang Spohn, Jian Tian, Ilya Shpitser, Nils Nilsson, Edward T. Purcell, and David Spiegelhalter.